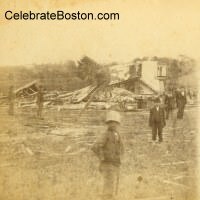 On August 9, 1878, a violent tornado swept through the village of Wallingford, Connecticut. 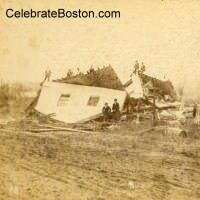 It is the second worst tornado in New England history in terms of loss of life, after the great Worcester tornado of 1953. It is estimated that the Wallingford tornado would be classified as an F4 in intensity on today's Fujita Scale, with the force of winds lying between 207 and 250 miles per hour. At least 35 people were killed, and 90 structures totally demolished. "Toward the close of this beautiful day the wind began to rise rapidly, blowing chiefly from the west and southwest; frequent flashes of lightning were quickly succeeded by heavy thunder. About 6.15 pm the black clouds, hastening from the southwest and from the northwest, met above the Community lake, and poising themselves for a moment or more—as if gathering force and will for their death-work—swept eastward over us with desolating fury. The time from the formation of the cyclone until its destructive work in the Village was completed, did not exceed one and a half minutes; indeed, Samuel Hopson, living four miles east of the churches, thinks that the damage in his vicinity was done at about a quarter past six. From his testimony, and from the statements of others, it is clear that the velocity of the storm was very great. The tornado was at once followed by torrents of water, which continued to fall for ten or twelve minutes. The water came down in sheets, rather than in drops, like an ordinary shower. When the fury of the rain had somewhat subsided, the ringing of the bell was heard, and the greater part of the village residents, who had no idea of what work the storm demon had wrought, thought only of fire; but as they hurriedly hastened northward, they were astonished witnesses of the scene." "Like a woe-singed arrow, shot by blind Fate against her favorite, burst one of the most destructive tornadoes on record, out of the ball–like and imply sky which overhung the pleasant village of Wallingford, and its 5,000 unsuspecting inhabitants last night in the premature dusk. People sat quickly, the day's toil ended, about the supper hour, hearing the wind in the tree-tops. Like a warning voice, grow louder. Black clouds, like somber birds of ill-omen, went scurrying overhead. The wind was uneasy, shifting from quarter to quarter, and about 6 o’clock huge clouds, borne by conflicting currents, met over the doomed village. Instantly, there shot up from Community Lake a column of water, smooth, dizzy, rotary, and Wallingford had her first veritable waterspout. In the seething water went up a boat, while its owner, who, instinctively fearing harm, and who had just [jumped out of] it clung trembling to a huge tree root, and saw the waters drawn up till the lake bottom twenty feet below was bare. Not far from the lake, what is known as the said plains, in the northern part of the village, industrious Irish laborers and mechanics had reared their simply built but comfortable dwellings. Swifter than thought the tornado swooped on these and instantly all was havoc and ruin. A few persons had had sufficient time to be alarmed and ran out of the houses. They were only out in time to see their late homes blown over as if they had been houses of cards, and to hear shrieks and cries and the crash of falling walls and roofs, while the tornado howled along on its swift mission. People were blown in the air to great distances. One boy was blown from his home and in some mysterious manner beheaded. One woman, hurled along over lacerating roads, had one foot torn from the leg, Another had her hand nearly torn off. Frederic Littlewood, aged forty-five, walking with his wife in Main street, sat down in a gutter, while she fled. Some flying missile had killed him outright, but left him sitting upright, when his wife found him after the storm. A man was blown over a precipice, with the wagon in which he was riding. Whole families were found buried in the ruins of leveled houses. Some maintained their presence of mind. One boy thought to seek shelter close to a wail in a cellar, and timbers fell about him and he was safe, but the panic caused by the crash of many buildings falling almost simultaneously was almost universal. In less than ten minutes, though the rain, which had fallen intermittently and with varying force for some hours had begun to pour, the elements seemed sated. The rain in fact was a blessing; a flood of tears for the ruin; a deluge to extinguish the flames, which had been started by overturning lamps and stoves, and which threatened infernal horrors. Then for a brief time the town seemed paralyzed, but not long. The authorities were energetic and alert. Thirty special constables were sworn in, and those, who had been robbed by the storm, were safe from human pillagers. Then there was time to look about. The handsome three-story brick high school building had lost two stories, and was a ruin; the spoon factory of George Graiser, a brick building, was leveled; the Catholic church, of wood, was overthrown, and the pieces had drifted to great distances on the fierce air currents; monuments and gravestones in the graveyards had been overthrown and broken in fragments; part of the roof of the Wallingford Community's factory had been blown off and about forty dwellings and fifty barns had been wrecked or injured, the majority being rendered tenantless. Then came the search for people known to have been in the ruined buildings. Most of those killed and injured were Irish. Families were dug out of ruins, Where they were shuddering with apprehension of what might come. People were picked up at long distances from home insensible and more or less injured. The dead were carried to the Catholic school-house, a small wooden building on "the plains," and there laid out in pine boxes. Such a scene could never he forgotten. Women with disheveled hair and streaming eyes, weeping for their dead children. [A] strong-featured man with compressed lips, wringing their hands and unable to keep back tears. Above all was suspense. the rumors exaggerated the actual loss of life and the whole town was distracted with apprehension. Men hurried to and fro, in and out of the extemporized morgue with haggard faces and with steaming breath. Water trickled from the dead bodies, the ice melting, and mingled with blood, and there were sickly reflections in the strange and weird mirror. There were walls and cries and fierce agony, like a turbid stream, too dark and deep for expression. There was no sleep. All night long the search for the dead and wounded went on, and by the ghastly gray of the morning the list had reached saddening proportions. Strange tales of the evidences of the force of the wind, or rather cyclone, were mentioned by the searchers, and of its freaks. Mr. Murray stepped into an addition of his house not closed in, and was found buried up to his neck in sand where it had been blown. Trees two feet in diameter were snapped like pipe-stems and blown to considerable distances. Mrs. Joseph Huldie held her child in her arms and was scalped, while her little one was crushed. A little wooden house directly in the tornado's path escaped unscathed. C. O. Campbel's barn was carried away and the hay left standing. Robert Saunders' house was turned upside down. Mr. J. Holdie, a silversmith lost all his household furniture, and his family, consisting of a wife, a daughter and an infant boy. He was kissing his baby and tossing it up when the tornado struck his house, while his wife was engaged getting tea, singing happily the while. The building was completely wrecked, and he, seizing a ladder, was carried through the air 200 feet. Mrs. Downs' body was blown 600 feet and stripped of clothing. John Lynch's haystack traveled an eighth of a mile through the air and then dropped. A cow lost both of its horns through the agency of a flying missile. Andrew Ennis' house broke in two, leaving his family safe, though frightened. Telegraph wires were blown down for long distances. A woman who was about to give birth to a child had one leg broken. The child was born today. A majority of the buildings damaged were mortgaged to the Meriden Savings Bank, on which the loss will fall heavily. The total value of property destroyed cannot fall short of a quarter of a million dollars. A committee of relief was appointed this afternoon, and Governor Hubbard has contributed to the fund $100."